Mitochondria were first observed by “Altmann” in 1894 who described as “bioblasts”. Benda (1897) called them “mitochondria”. (mitoG =thread; chondrionG=granule). The number of mitochondria varies with the cell type and functional stages. In eukaryotes, approximately 2000 mitochondria occupy one-fifth of its total cell volume. The mitochondrial chemical composition is concerned, mitochondria consist of 65-70% proteins, 25-30% lipids, 5-7% DNA and 0.5% RNA. The outer membrane of the mitochondria has “porins”, which permits molecules up to 10kd. Matrix is a gel-like solution, containing a high concentration of soluble enzymes, substrate, nucleotide cofactors, ions. 1897-98 – Benda- gave name as “Mitochondria”. He stained the mitochondria with “alizarin” and “crystal violet”. 1934 – Bensley & Hoperr – said mitochondria is the site for the cellular respiration. The mitochondrion is a subcellular organelle having the outer and inner membranes enclosing the matrix. The inner membrane is highly selective in its permeable characteristics. The inner membrane contains the respiratory chain and translocating systems. The knobs like protrusions represent the ATP synthase system. 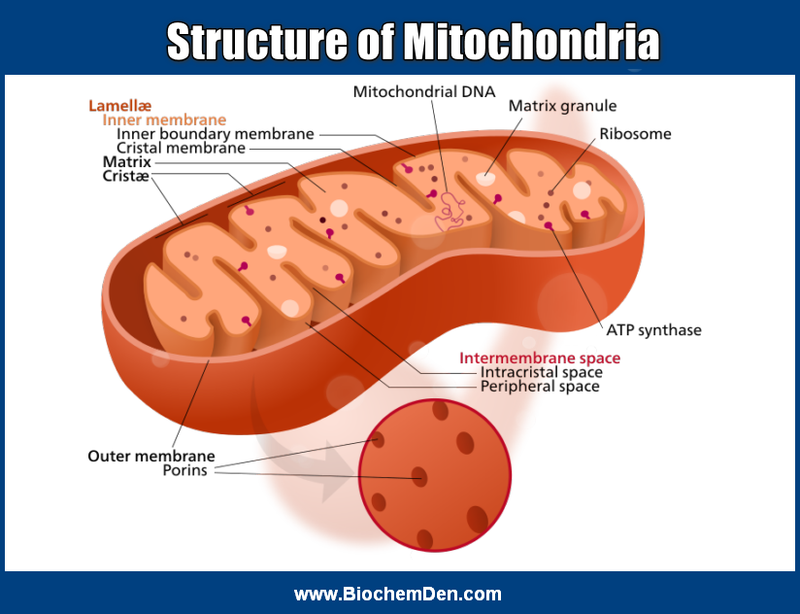 Hence, there are two compartments in mitochondria: the intermembrane space between the outer and inner membranes and the matrix, which is bounded by the inner membrane. With rare conditions, all eukaryotic cells contain membrane-bound organelles called mitochondria, where enzymes for electron and proton (hydrogen ion) transport and ATP synthesis reside. Mitochondria are called the “Powerhouses” of the cell because ATP is the primary currency of energy exchanges in the cell. Mitochondria have two membranes. the outer membrane contains proteins called porins, that allow passage of molecules with molecular weights as high as 10,000. The inner membrane is less permeable. It is numerous infoldings, called cristae, protrude into the matrix, or central space. The Criste increases the surface area for reactions that depend upon the creation of a proton gradient across the cristae and are the sites of the enzymes of respiration and ATP production. In bacterial cells, no respiratory enzymes are associated with the plasma membranes of eukaryotic cells. The inner membrane encloses the mitochondria matrix, which is quite dense and is loaded with ribosomes, DNA and often large calcium phosphate granules. Mitochondrial ribosomes are smaller than the cytoplasmic ribosomes and are similar to the bacterial ribosomes in a number of characters, e.g., size, the composition of subunits, etc. Mitochondrial DNA is a closed circular molecule much like bacterial DNA. The mitochondrial matrix and compartment are different from other organelles in chemical and enzymatic composition. Presence of DNA and ribosomes in the mitochondria makes these organelles independent for production of some of their own proteins. However, most of the mitochondrial proteins are synthesized under the direction of the cell nucleus. Multiplication of mitochondria is by binary fission – again a prokaryotic, bacterial character. Another important feature of mitochondria is their character of changing the structure. This is dependent upon the physiological activity of the cell as well as the activity occurring in the organelle. When ATP concentration is low or the respiratory chain is inhibited, the mitochondria are seen in an inactive or orthodox state. Under this condition, the matrix of the mitochondria occupies a larger area. In an active or the condensed state (when mitochondria are actively engaged in photo-phosphorylation and electron transport), the cristae are more randomly distributed and the intermembrane space remains highly enlarged. The mitochondria are organelles which transfer the chemical energy of the metabolites of the cell (through Krebs cycle and the respiratory chain) into the high-energy phosphate bond of ATP. Thus, mitochondria are the “powerhouse of the cell”, that produce the energy necessary for many vital cellular functions via, motility contraction (muscle contraction), biosynthesis of cell bioluminescence, etc.